Lefse is a traditional soft Norwegian flatbread. Lefse is made out of potato, milk or cream (or sometimes lard) and flour, and cooked on a griddle. Special tools are available for lefse baking, including long wooden turning sticks and special rolling pins with deep grooves. 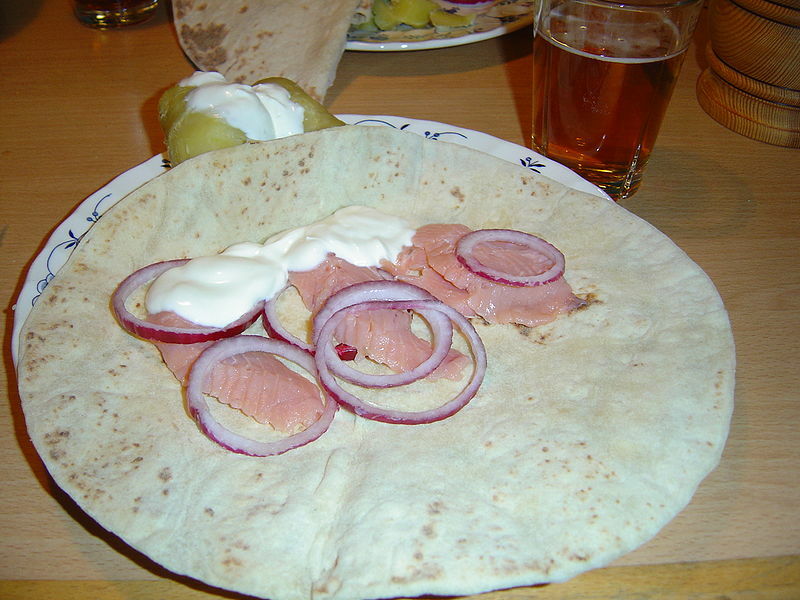 Left: A lefse topped with rakfisk served with potatoes, onion and sour cream. Tjukklefse or tykklefse (thick lefse) is thicker, and often served with coffee as a cake. In central Norway, a variation called tynnlefse (thin lefse) is made, which is rolled up with butter, sugar and cinnamon (or with butter and brown sugar), and eaten as a cake. Potetlefse (potato lefse) is often used in place of a hot-dog bun and can be used to roll up sausages. This is also known as pølse med lompe in Norway, lompe being the "smaller-cousin" of the potato lefse. There are many ways of flavoring lefse. The most common is adding butter to the lefse and rolling it up. In Norwegian, this is known as "lefse-klenning". Other options include adding cinnamon, or spreading jelly or lingonberries upon it. Scandinavian-American variations include rolling it with a thin layer of peanut butter and sugar, with butter and white or brown sugar, with butter and corn syrup, or with ham and eggs. Also quite good with beef, and other savory items, it is comparable to a thin tortilla. Lefse is a traditional accompanyment to lutefisk, and the fish is often rolled up in the lefse. 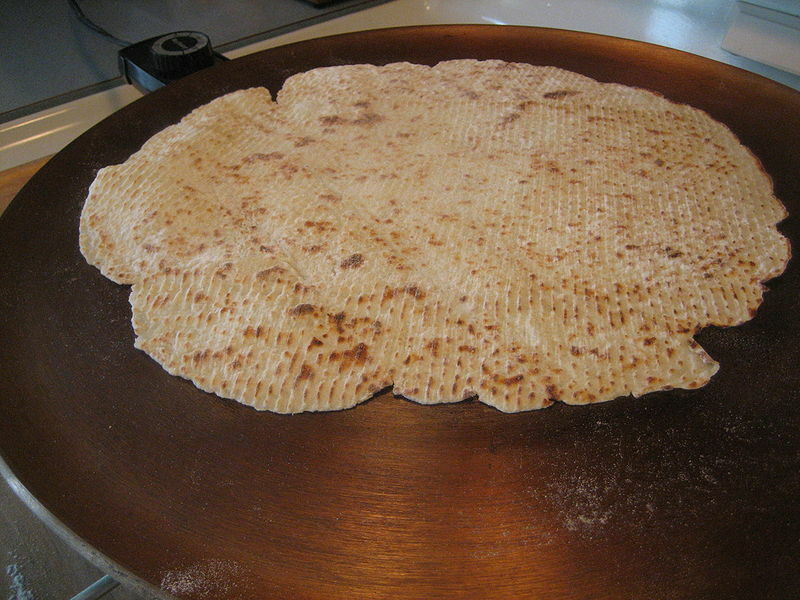 Many Norwegian-Americans eat lefse primarily around Thanksgiving and Christmas. Family members often gather to cook lefse as a group effort because the process is more enjoyable as a traditional holiday activity. This gathering also provides training to younger generations keeping the tradition alive. Boil, drain and rinse ten pounds of peeled Russet potatoes, but be very careful not to over cook them. That's the key the perfect rolling. Wet potatoes give you sticky lefse! Rice the warm potatoes and add 2/3 cups half and half (half cream in the United Kingdom), 2 sticks of margarine, 1 TBSP salt and 1TBSP of sugar. Blend well with an electric beater. Place this bowl of potatoes in the fridge overnight covered loosely with a piece of wax or parchment paper to allow them to evaporate some of the moisture. In the morning, add 6 cups of flour and mix well with your hands. 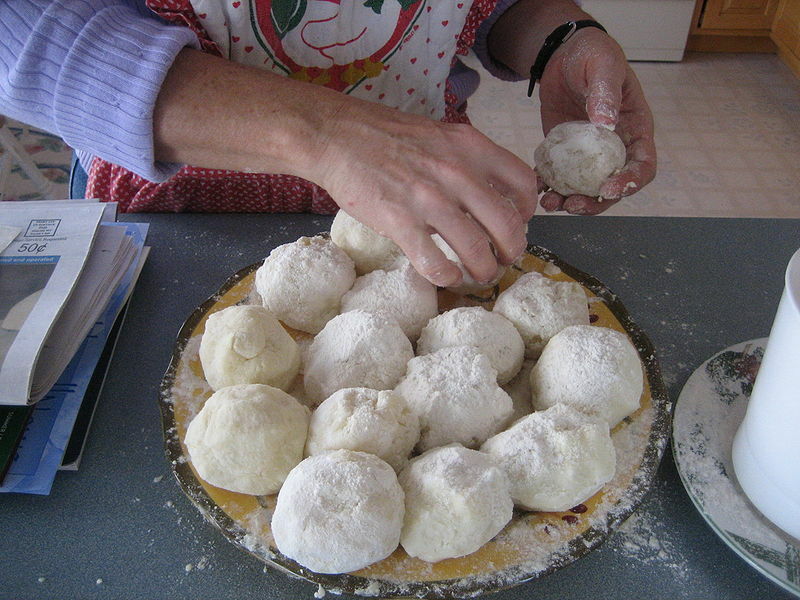 Left: Balls of lefse dough waiting to be flattened with a rolling pin. You definitely need a lefse stick to get the rolled lefse from the rolling surface to the grill. You can buy one, or make your own. Last is the most important part. As you remove them from the grill, place them in several layers of towels to sweat until they are cool. This takes several hours. Once cooled, store in saran in the fridge, or freeze in freezer bags. Left: A lefse on a griddle, cooking. Enjoy with butter and sugar!